The West Wind Motel & Townhouses have been operating since 1988. It is a beautiful 3.3-acre property, nestled at the base of the Tug Hill Plateau, offering breathtaking views of the Adirondack Mountains. The motel boasts 7 rooms, 4 townhouses, 2 barns, and ample parking space for trucks, trailers, snowmobiles, and ATVs. 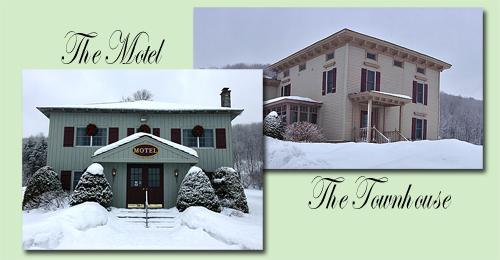 The Tug Hill region averages around 200-300 inches of snow fall each year. That's 16.5-25 feet of snow every year; making this the perfect place to be, if you enjoy snowmobiling or other outdoor winter activities! Just seconds down the road, there are 3 great restaurants and a place to downhill and cross-country ski! Here at the motel, we offer direct and easy access to snowmobile and ATV trails; as the property sits on Trail C5M. This trail can also be accessed from the top of Tug Hill from Gomer Hill Road, Morgan Gulf Road, or Lee Gulf Road. From Trail C5M, you can ride on hundreds of miles of snowmobile trails to just about anywhere from Turin to Oswego, or even Plattsburg. We are Now Offering Yamaha ATV Rentals!